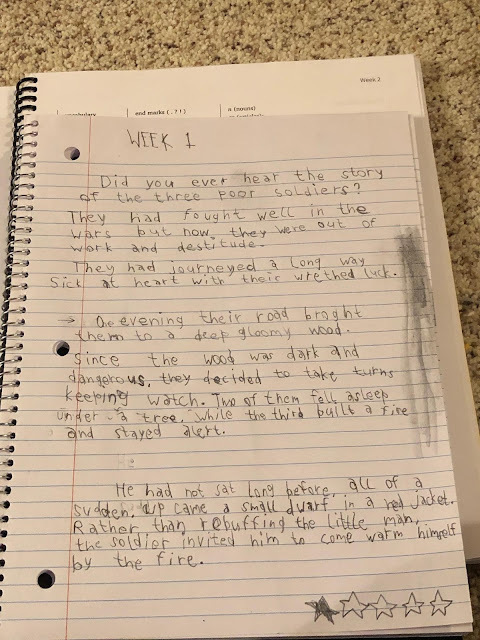 When I think of top quality writing programs, the first company that comes to mind is the Institute for Excellence in Writing (IEW) because their products are always very well planned, well written, and work great in our homeschool. I had reviews for their Fix It! Grammar program, but we had not had the chance to use it, until now. We have been blessed to review Fix It! Grammar: The Nose Tree (Book 1.) For this review, we received both the Student Book and the Teacher's Manual. There are six levels to Fix It! Grammar, and Level 1 seemed to be perfect for us. 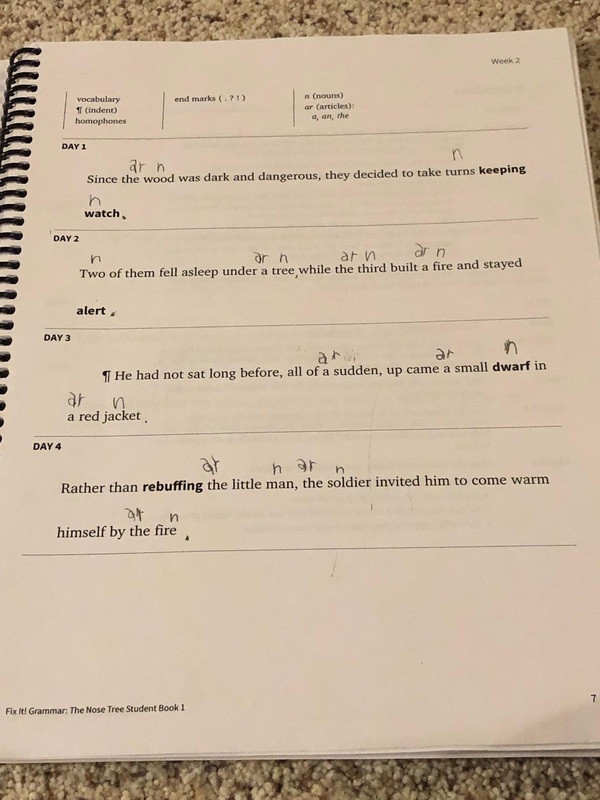 Each day, days 1-4, your child is tasked with corrected, editing, and labeling a sentence from a story-in the case of Bookl 1, it is The Nose Tree. On Day 5, your child is then tasked with rewriting the corrected passage from Days 1-4. Since there are six levels, you may be unsure of where to start. There is a placement test you can have your child take, so that really helped narrow it down for us, but IEW does suggest starting at Book 1 if you haven't used this program before. 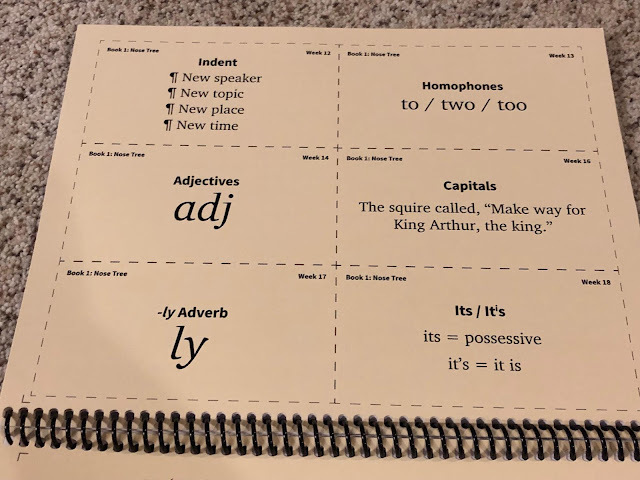 The student books are consumable, and intended for only one student at a time, and your child is expected to keep a notebook for copywork, as well. It's not boring copy work, but they are rewriting the story within the book. Your child can complete all their grammar lessons in 15 mins a day, and reinforce handwriting as well. 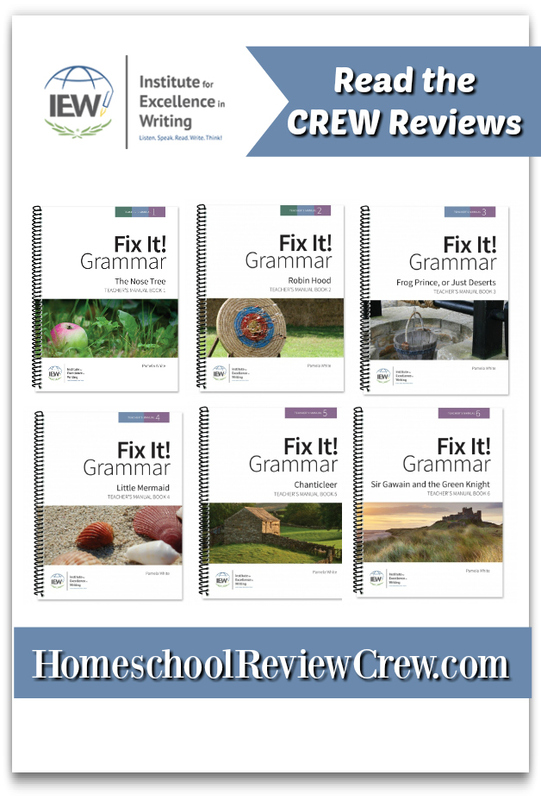 The program takes the book line by line, passage by passage, to teach grammar, sentence structure, and editing. Mr. B often wants to work ahead, because he can finish rather quickly, so some days he finishes two day's worth of lessons instead of just one. Older students can easily work at a double time pace and complete the program in the half the time. Again, it's important to note that each level builds off the levels before, so if you have never used Fix It! 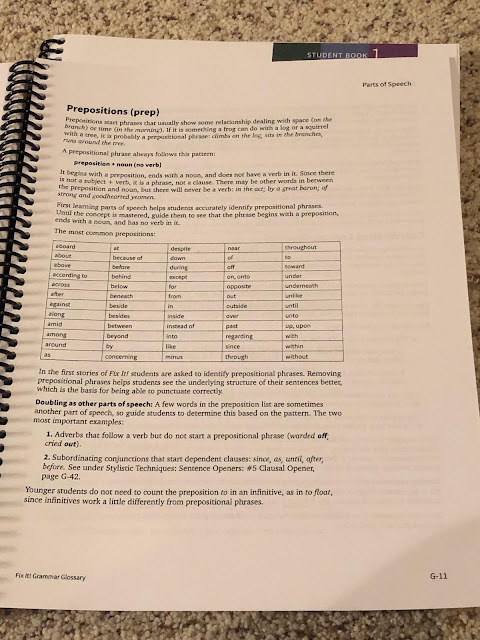 Grammar, you may want to start out with Level 1 anyway, and work at a faster pace, just so you won't risk having any sort of gaps in a higher level. The Teacher's Manual has all of the instructions for you to teach your child, and it includes a help section in the back. The Glossary section is invaluable to refreshing grammar rules! It's great having the resource in the back of my book so I can easily double check when Mr. B asks me a question. There's a lot in the Teacher's Manual, and it really breaks down the teaching to make it easy for you. I know Day 1 seems to be the day with the most instruction where you're explaining the part of speech, and the overall directions (such as put an ar over the articles...) but I didn't feel as if it required a great deal of my time to explain and teach him. The answers are all located within the teacher's manual, which makes for easy reference and grading. Having both books spiral bound is convenient, and easy to work with them that way. Mr. B doesn't balk or try to avoid his language arts now, which is great! Language Arts has always been a thorn in my side because he hates doing it so much. But Fix It! Grammar is short lessons that he can easily understand, without a lot of handwriting until the last day. So that's great for his attention span and fine motor issues. Language Arts is a weaker subject for him, so I do have to help him quite a bit, but overall Fix It! Grammar is proving to be excellent for him. As I mentioned above, the physical student books like we received are consumable and intended for only one student. If you order the PDF digital version, you may print off a set of student pages for each student in your family. Since I only have one using this, the physical set is perfect for us. This is more than just one week. I had him continue on, in story format, one the same page since that's what you're supposed to do. Another really cool part of the Student Book are the included flash cards in the back. The program tells you to cut them out, and place them in the notebook, but I know Mr. B HAHA! I know if I cut those out, they will not stay in the notebook, so I chose to leave them in the book and he can flip to them to use as reference as needed. This is what works for us, but you may find you'd rather follow directions and keep them in the notebook. I can remember from my college days, a professor made the comment we write as we read. By that he meant when we read something, or a particular author, we have a tendency to write in the same style as what we are reading. That is why I really like this so much. The Nose Tree is a book written by Warick Hutton. Fix It! 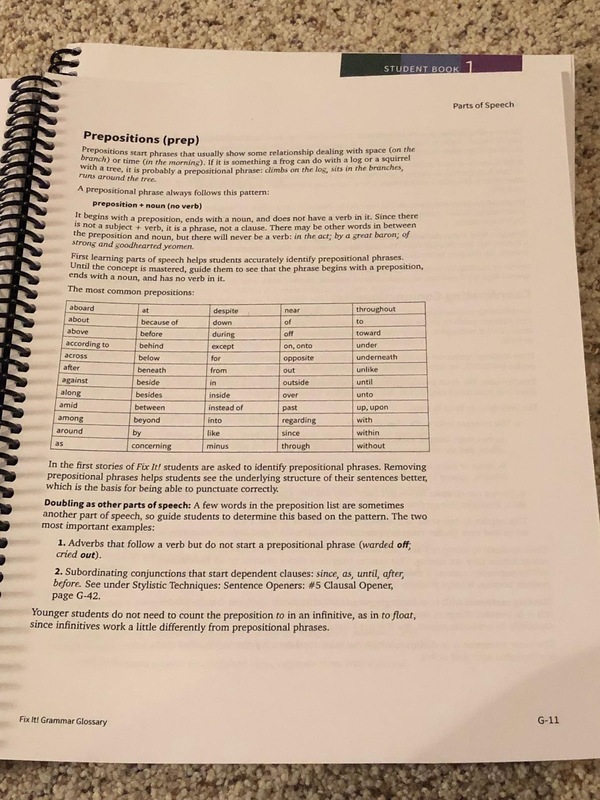 Grammar uses this book, line by line, to teach grammar. So your child is learning grammar, being exposed to literature, and working on their writing skills all at the same time. Mr. B isn't a big fan of fiction, but I caught him one day reading all the way through his student book. He was so enthralled by the lessons, he said this was a book he really would like to own! I was shocked! That's enough proof for me that this program is a great fit for our family. We like that the lessons are short in duration, and are engaging with the continuation of the story. Mr. B doesn't get fatigued doing the work, and he prefers to work at a double pace-so that's a huge win for me. I would highly recommend this to others, especially those whose children are on the spectrum or have ADHD. Our family is only one of 60 to be selected to review this product. The others reviewed various levels, so please be sure to click the banner below to read their reviews!